Driebergen-Zeist, Netherlands: 3 July, 2017 – Energy companies Eneco and Essent, carpet manufacturer Tarkett (formerly Desso) and cocoa trader Cocoanect announce that they are actively engaging in a climate measure that also serves other urgent sustainability goals: conservation of tropical rainforests. This marks the launch of the REDD+ Business Initiative, an initiative where member companies are shaping effective business-led solutions which demonstrate that companies are effective partners in the fight against deforestation and climate change. Deforestation accounts for 10% of global CO2 emissions  and is one of the biggest threats to the climate. Conversely, stopping it is one of the most effective measures in the fight against climate change bringing immediate results. Besides investing in the reduction of CO2 emissions in their own operations and their value chain, companies can also directly contribute to this enormous task and integrate this into their business models. That is why, on 27 June at the annual conference of the green business organization De Groene Zaak in the Netherlands, Eneco, Essent, Tarkett and Cocoanect signed a cooperation agreement to jointly invest in forest management and sustainable agriculture in the tropics based on ‘REDD+’ and form the REDD+ Business Initiative. REDD+ is a UN instrument for the controlled conservation and sustainable management of forests. The companies work closely together with the Dutch Development Bank FMO and Ecosphere+, part of the Althelia Climate Fund, an investment fund of more than €100 million that is a world leader in this area. Both are also members of the REDD+ Business Initiative, as well as the entrepreneurial organization De Groene Zaak, which forms the bridge for new companies wanting to join. The aim of the initiative is to motivate more companies to invest in REDD+ projects. REDD+ is a promising instrument for addressing the drivers of deforestation, but it will only reach its potential when it reaches scale, ideally when governments make it part of regular climate policy, such as the EU Emission Trading System (EU ETS), where REDD+ would allow a cost-effective route for compliance for companies and increase mitigation ambition. We hope this will happen in the future, but the current reality is that we are losing our rainforests at a terrifying rate, together with their wealth of biodiversity. This also means that the huge amount of CO2 that forests store is ending up in the atmosphere and one of the most cost-effective methods of tackling climate change is literally being burned down, along with the valuable ecosystem services they provide. The participants in the REDD+ Business Initiative find this unacceptable and urge early action on a voluntary basis by a much wider group of companies. They also call for government support, like setting up a banking system for demonstrable emission reductions, in order to reward early action. The REDD+ Business Initiative wants to lead by example. They demonstrate that companies are willing to develop new initiatives to realize both global climate goals and the Sustainable Development Goals and that they are willing to work together and share knowledge. 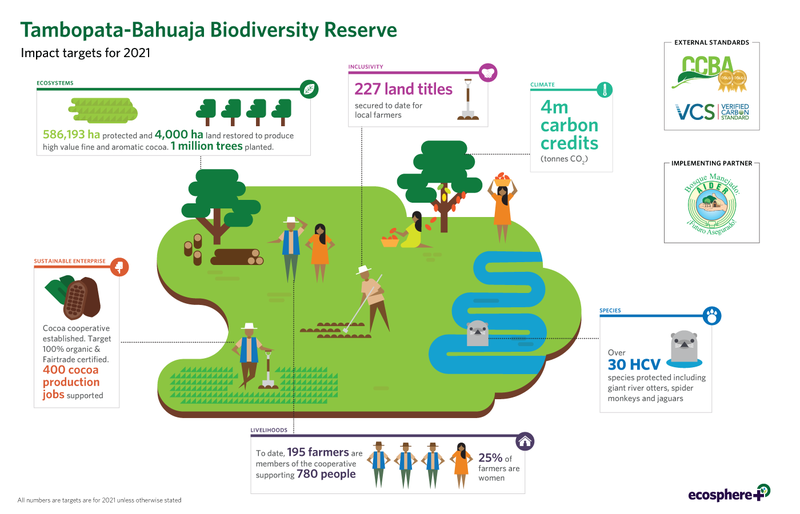 The members invest in the Tambopata Biodiversity Reserve project in Peru as a signal that companies are willing to work together on the fight against deforestation as one of the main causes of and near term solutions to climate change, and contribute at the same time to the Sustainable Development Goals and the health of vital ecosystems. IPCC (2014) ‘Agriculture, forestry and other land use (AFOLU)’. In: IPCC AR5, WG3. Photo caption: REDD+ Business Initiative members at the launch of the initiative. 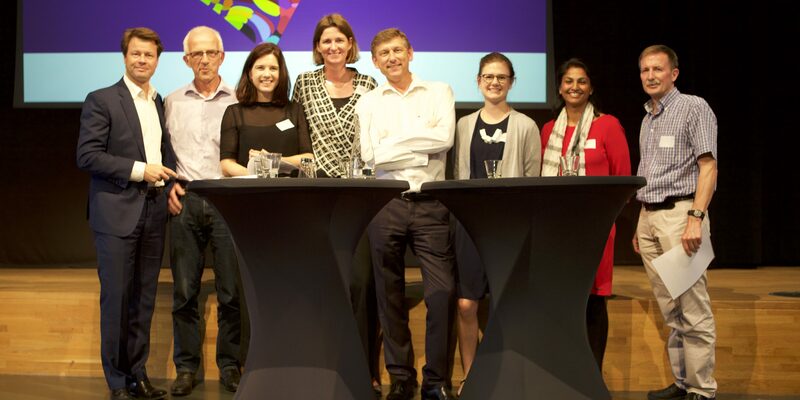 From left to right Jan-Willem Beukers (Eneco), Erik van Zadelhoff (De Groene Zaak), Anne van der Even (Cocoanect), Marjolein Demmers (De Groene Zaak), Rudi Daelmans (Desso), Lucy Arndt (Ecosphere+), Varishna Tewarie (FMO), and Chris Arthers (Essent).